An army marches on its stomach… and so do police recruits. Between them, Domestic Services staff Angela Calvert and Sandra Grant have served thousands of meals to recruits since they started working at the Police Academy in the 1990s. And from the Academy office, Administration Assistant Debbie Thompson has helped hundreds of recruits since she started as a stenographer (shorthand typist) in 1981. The ladies recall when hot breakfasts were served everyday and there was dessert at lunchtime and after dinner. The menu has changed dramatically over the decades: once, crumbed sausage with onion gravy and hamsteak with egg were standard. Now there are salads, gluten-free and vegetarian options – and hot chips are offered just once a week. They’ve noticed the recruits are now more varied in age, with more women in the courses, and some are shorter (after the height restriction was removed). Debbie recalls the camaraderie of the recruits’ study room, back before everyone had a laptop and studied in their room. While they didn’t predict a young Darren Hine from Course 10 would become Commissioner, they are impressed that he never fails to thank them for their work and to offer to help with the washing up. 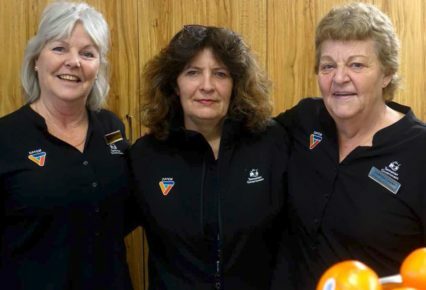 Above: Angela Calvert, Debbie Thompson and Sandra Grant at the servery of the Tasmania Police Academy. This page -- https://www.police.tas.gov.au/about-us/100-years-women-policing-tasmania-police/civilian-women-tasmania-police/serving-service-ladies-academy/ -- was last published on February 13, 2018 by the Department of Police, Fire and Emergency Management.